If your household is as busy as mine, then you know that it is difficult to make sure each member of the family drinks enough water and eats the recommended servings of fruit everyday. It is nearly impossible to keep track of how much I consume myself, never mind four other people. Fruit2O Essentials flavored water seems to be the perfect solution to this problem. This product could easily replace sugary juices for my children, which I usually reserve for a treat, only my children will be able to drink this beverage daily. Everyone in my household was surprised at the taste of this flavored water. It did not taste like water with a hint of fruit, but rather it was sweet and tasted like a punch. We received all six flavors to try. I am lucky I got a sip of two of the flavors because my husband and 6yr old son drank all the bottles of Fruit2O Essentials so quickly. I really should not complain because each bottle gives my family several of the vitamins and minerals found in two servings of fruit plus 1g of fiber. This product also contains no calories or sugar. Adding Fruit2O Essentials to the grocery list is something I can easily commit to if it means helping my family be healthier. Here are some other small changes you and I can make according to celebrity fitness trainer and wellness expert Desi Bartlett . . .
Fruit2O has partnered with the American Diabetes Association to help women make small changes such as these to better their health. Beginning May 14, 2010 Fruit2O will donate $1 to your local American Diabetes Association chapter in exchange for each pledge made to make a small change for the better. You can read the details on the Fruit2O Facebook page. Thank you to Fruit2O for providing us with samples free of charge to base this review upon and for providing additional product for our contest prize. This article was written as part of a campaign for MomSelect. 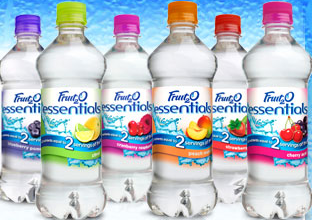 One lucky reader will receive a one-month supply of Fruit2o Essentials water. Leave a comment telling me what small change you could make to take a baby step towards a healthier life. You MUST do this to be eligible to win this contest. 3) For 10 extra entries, blog about this contest linking back to this post AND Fruit2o.com . Then come back here and leave TEN separate comments with the link to your blog post. This contest will be closed on Monday, May 17th, 2010 at 11:59pm EST. A random number drawing will be held shortly after. The winner will be announced here and will be contact via email or through their blog. If the winner does not respond within 48 hours, a new number will be drawn.